When Ruben and his best friend Jeddy find a dead body on the beach in 1929, their lives change forever. A weird reaction from the local law enforcement causes Ruben to give the body some thought and he eventually discovers that the dead man was an infamous rum runner. During this time of Prohibition, rum runners bought booze from Canada or the West Indies and smuggled it into the country. Because the ships had to anchor in international waters, rum runners would load up small boats with the liquor and sneak it onto shore in the dead of night. Police were paid off to look the other way. But things are changing. Gangs from big cities are starting to control all the business and trying to stamp out the smaller independent bootleggers... including the local team that mans a ship called the Black Duck. Although Ruben and Jeddy have always been best friends, Jeddy, son of the local policeman, feels conflicted about getting involved with the rum runners. Ruben begins to see how much the rum-runners are infiltrating his hometown even as he himself gets swept up in their operations. I read most of this book in the airport and on the plane on my way back from Orlando. It starts off a bit slowly, but picks up once Ruben gets caught up in the rum smuggling business. There are two storylines here. The first is set in modern day. A middle school boy named David is working on an article that he hopes will be published in the paper. He finds the elderly Ruben and attempts to interview him about the Black Duck. At first Ruben holds back, but as the two get to know each other over several weeks' time, Ruben tells him more and more of the story. Ruben's story is the main part of the book. I had two favorite things about this book. The first is that Ruben tells David that none of the horrible stuff would have happened, had he and Jeddy just let well enough alone, if they hadn't pressed the issue with the dead body. I love this because I so often can't get on board with mysteries and adventure stories where the kids get all wrapped up in things they should just let the grownups handle. My other favorite thing about this book is how it looks at morality and how its view of morality changes as the book progresses. Ruben knew the rum smuggling was bad, that it was illegal. As he takes a harder look at his town, though, he sees so many people caught up in it. His dad's boss is heavily involved and Ruben comes to realize that his dad is forced to look the other way or risk losing his job. 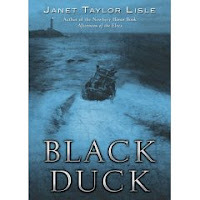 The crewmen of the Black Duck are actually regarded as local heroes because they help out people in the area. They're bringing in lots of money in the time right after the stock market crash, and they're sharing it with those that need it. If they're helping so many people, how can they be all bad? Ruben's best friend Jeddy is the son of the local policeman and he thinks he knows what's right. But it's the things he doesn't know that will bring about his betrayal and bring down the Black Duck. This book takes the things we know are "bad" and turns them all about so that we can look at them a different way. Also reviewed by bookshelves of doom, Becky's Book Reviews, and Fuse #8. This summary had really helped me with my homework...thanks! Thanks for your comment! The summary in this post is not meant to be a complete story like you might put in a book report. It's meant to tell you a little bit about what the book's about in a way that makes you want to read it and find out the ending on your own. I hope you enjoyed Black Duck! this really helped my understand the book better! thanks!!!! You should put more about the characters.Like there age,physical diescription,character traits.But it is still good. I think this summary was a great overview of the book. I am just now beginning this book for an upcoming reading log, and reading this summary will definately help me in the longrun. Thank you so mcuh and I think it was a fantastic summary. For those of you who think otherwise, this is a SUMMARY. Most summaries of books don't contain all the prick details and the little bits-and-pieces of information that are not very important to the story and its climax. That summary was most likely not meant to be put in a book report. It was most likely made as a little summary to tell readers who have not read this book exactly what this book is about. Do not rely on the internet for book report and school project information. Schools are now starting to get this scanner that scans your papers and it takes the scanned words and sees if they are copy-pasted to a report from any other website. Yes, technology is THAT good now. So I'd be careful. Don't come to the internet looking for a full book report and being upset that a little summary that is NOT meant for a book report didn't help you. I'm sorry, but that's just the way I feel. TY (ty = thatnk you) but i hope u didnt talk this from that back of the book cuze i need to for a repot that i forgot about. Abby, have you considered a career writing Sparknotes? It looks like you already have a following of peeps looking for book report fodder! BTW, your review was excellent. Makes me want to pick up a copy. Thanks for the fun! Your Assignment: Go Get Some Reader's Advisory!